In 2015, the twin Laser Interferometer Gravitational-wave Observatories (LIGO) made the first direct detection of gravitational waves created by two black holes that were spinning rapidly around each other before colliding and merging to form a larger black hole. The discovery was announced as unequivocal proof that Einstein’s theory of general relativity was valid. But, ironically, three physicists recently announced that the discovery may have in fact achieved the opposite: invalidate General Relativity and instead signal proof that the first signs of quantum gravity may have been found. A group of physicists studying the publicly-released data that LIGO has collected so far, claims to have uncovered wave “echoes’ that could contradict general relativity’s predictions. Ironically, LIGO’s epic discovery of gravitational waves was thought to be the ultimate confirmation of Einstein’s theory, but may soon prove to be it’s undoing. The three theoretical physicists, Jahed Abedi, Hannah Dykaar and Niayesh Afshordi, have published a new paper explaining that they have detected the first evidence of gravitational effects not explained by general relativity in the data. The team says they have spotted signs in the data of a quantum-gravity effect known simply as an echo. According to General Relativity , the event horizon is a smooth and infinitely thin surface: at any given moment, you’re either behind it, falling into the blackhole, or in front of it, looking into the abyss that is the black hole. But according to quantum mechanics, the event horizon is actually a ‘firewall’ of particles popping in and out of existence. When two black holes collide to form a larger blackhole, there is a very large amount of energy released. 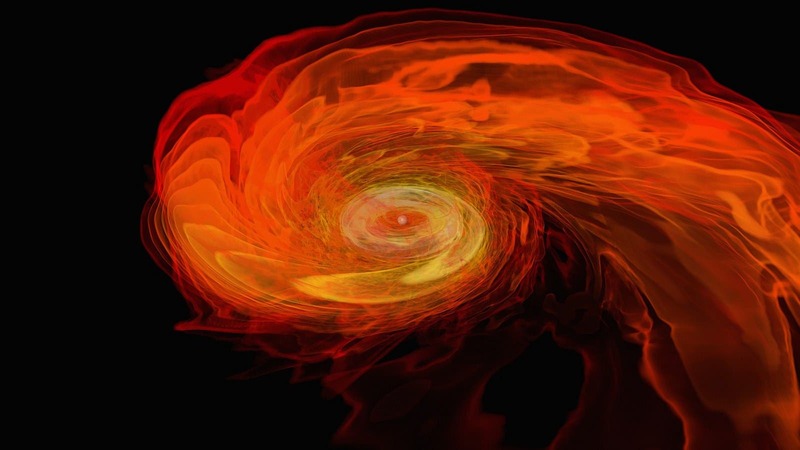 In LIGO’s first detection of a merger, made on September 14, 2015, two black holes weighing 29 and 36 solar masses merged to form a blackhole weighing 62 solar masses. The remaining three solar masses – equivalent to 178.7 billion trillion trillion trillion joules of energy – were according to General Relativity, with an infinitely thin event horizon, then the waves are immediately expelled into space. However, if quantum mechanics predictions are valid, then some of the waves are first trapped inside the firewall of particles, where they bounce around like echoes depending on the angle at which they were ensnared, and escape in a series of instalments. Corresponding to the delay in setting off into space, LIGO would have detected them similarly: not arriving all at once but as “echoes” with delays. The three physicists – Jahed Abedi, Hannah Dykaar and Niayesh Afshordi – simulated firewall-esque conditions using mirrors placed close to a computer-simulated blackhole to determine the intervals at which gravitational echoes from each of the three events LIGO has detected so far would arrive at. When they had their results, they went looking for similar signals in the LIGO data. The echoes will need further peer review investigation, as the researchers note they could disappear as more data comes in. If they continue to be observed, that would be show that while Einstein’s theory has held up for 100 years, it could break down in extreme circumstances — like in merger of two ancient black holes. That relativity also fails at the edge of a black hole’s event horizon, an inescapable point of no return for anything that crosses that boundary captured by the black hole’s awesome gravity. If quantum physics is correct, the black-hole event horizon should not be an invisible border, but rather a cosmic firewall. This supposed ring of high-energy particles would incinerate any matter that passes by. If this is true, it’s a violation of Einstein’s theory. Physicists proposed that if there was any sort of exotic phenomena, like a firewall, that the gravitational wave signatures would be followed by a series of echoes. Afshordi’s team studied the three black hole mergers that LIGO has observed so far, and discovered that each observation was followed by echoes at the exact intervals their models predicted. Only time and future observations by scientists and the LIGO team will be able to tell with any certainty if the echoes are real or a statistical fluke, caused by random background noise? .